Little Trout Bay Conservation Area is the LRCA’s second boat access to Lake Superior. The area offers a great trail, amazing views, a pavilion with picnic tables and interpretive panels, and a quiet reprieve from the hustle and bustle of everyday life. another popular activity is fishing for salmon, pickerel, whitefish, rainbow trout and lake trout. interpretive displays at many Conservation Areas including Cascades, Mission Island Marsh and Silver Harbour. 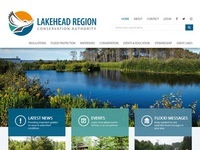 Since 2006 the Authority has helped to educate Grade 3 and 4 students about the importance of water conservation through the Lakehead Children’s Water Festival.